Students’ choice of study programme and field of study is related to their personal characteristics and background. With regard to fields of study, the largest differences between students by educational background are evident in the field of education (incl. teacher training): higher shares of students without higher education background are enrolled in these subjects than students with higher education background. In contrast, in around 70 % of EUROSTUDENT countries, the shares of students with higher education background are at least slightly higher in the field of natural sciences, mathematics and statistics, compared to students without higher education background. Differences also become apparent when looking at students enrolled in long national degree programmes: the share of students with higher education background is on average 6 percentage points higher compared to the shares for students without higher education background. Across EUROSTUDENT countries, 7% of students, on average, report having interrupted their current study programmes for at least 1 year. In some countries, the share is up to twice as large. 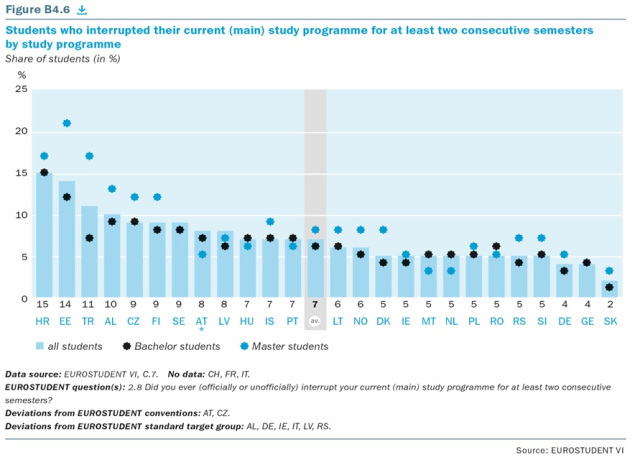 Data further show that the reasons behind such interruptions are of different importance for students with and without higher education background: for students with higher education background, the three main reasons (on cross-country average) are a lack of motivation (34 %), work-related reasons (24 %), and financial difficulties (23 %). For students without higher education background, in contrast, four main reasons are evident: financial difficulties (31 %), lack of motivation (28 %), as well as work- (26%) and family related reasons (25 %). In over 85 % of countries with available data, students without higher education background more often state financial difficulties as a reason for study interruption compared to students with higher education background. However, there are large cross-national variations with regard to the most-often stated reasons for interruption.